Honey ferments were my treasured discovery of 2014. I continue to be inspired by the medicinal quality of garlic in honey and the deliciousness of the fruit ferments. Having noshed through my jars of blueberries and peaches way too quickly (scooped into green tea was my favorite way), I needed to find a winter way to get my fix. Try this recipe as an unusual and charming Christmas gift for those you adore. (Raw) Honey is antibiotic, antiviral, antiseptic, antitoxic, anti-inflammatory, and anti-fungal. It is rich in vitamins, minerals and enzymes to boost our immunity which is especially important during the colder months. The simple carbohydrates in sugar provide our bodies with strength and endurance to defend against whatever ailment we are fighting. The glucose in honey is instantly absorbed providing a quick hit of energy, while the fructose is more slowly digested, providing more sustained energy. Pomegranates are a super food in their own right. Pomegranates are one of the world’s oldest fruits and have been in cultivation since the time of Moses. As with honey, pomegranates (latin for “apple with many seeds”) have a rich historical tradition. 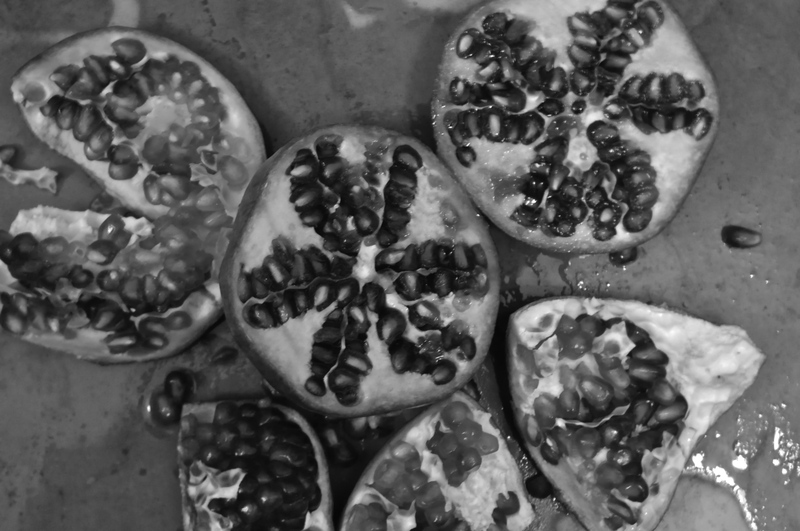 They have been labelled “the fruit of the dead” in Greek mythology (!) and were even contemplated as the possible “forbidden fruit” in the Garden of Eden. 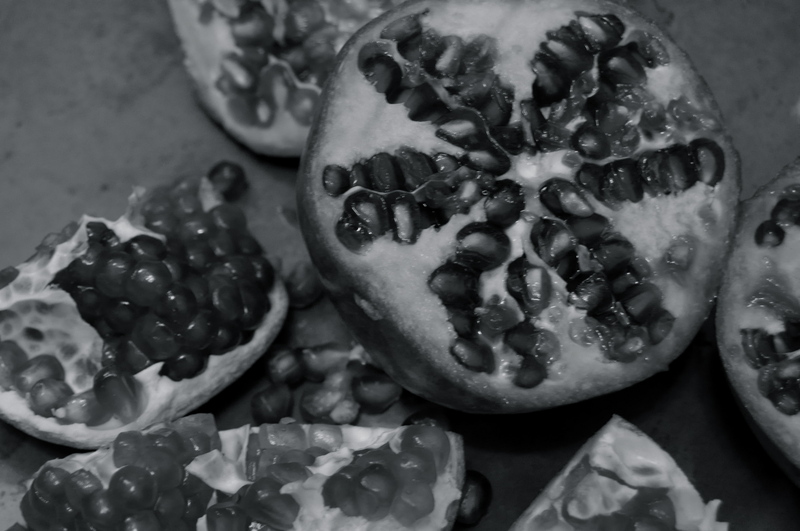 Jewish tradition speaks of a pomegranate having 613 seeds to represent the 613 commandements of the Torah. Revered as a symbol of health, fertility, and eternal life, I devour as many as possible while they are in season! Paired with such a vibrant history, I am addicted to the pomegranates health promoting qualities. The seeds contain 3 times as many antioxidants as blueberries and 4 times as many as oranges. Pomegranate has been shown to lower blood pressure and cholesterol and provide immunity building and cancer prevention. Their high levels of vitamin C make them a perfect winter fruit. 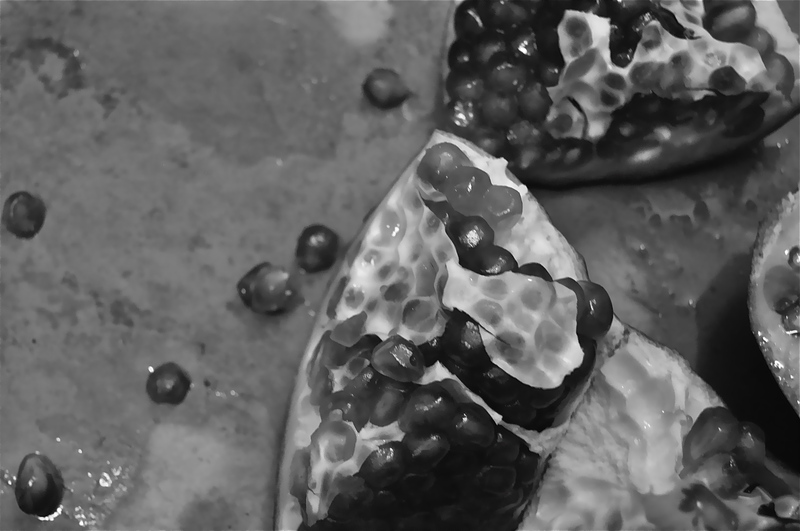 Remove the seeds from your pomegranate. Be careful as the juice stains everything. Place your seeds in interesting glass jars (flea markets and thrift stores are great places to score these! ), leaving 1 inch of headspace. Pour honey to just cover the tops of the seeds. Use a spoon to gently stir to ensure the honey seeps down throughout the jar. As the seeds ferment they will release juices, mixing with the honey and providing enough liquid to fill the rest of your jar. Place the lid on your jar and tighten. Reserve to a cool, dark place (like a cupboard or quiet section of your countertop). 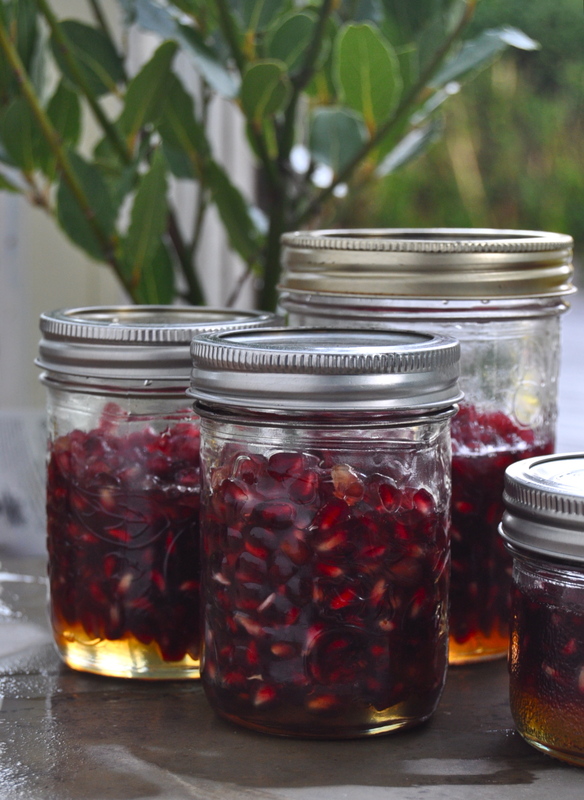 Once a day (or when you remember), flip the jar over to allow honey to evenly coat all of the pomegranate seeds. Allow to ferment for 1-2 weeks. Taste every few days after the first week. Once the “fizziness” of the seeds is to the point you prefer, you can move your jars to the fridge. As I live in a cool part of the world (Canada), at this time of year I can leave this on the counter where it continues to slowly ferment happily. There are no strict rules, taste as you go and do what feels right to you. 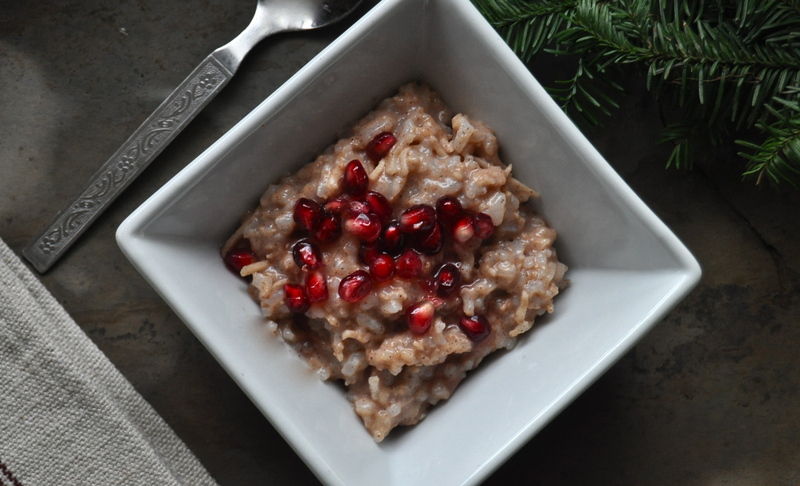 Upon fermenting too long the pomegranates become boozy, which is not necessarily a bad thing 😉 Use your finished product as a sauce for oatmeal, rice pudding (pictured above), ice-cream, in tea, on waffles, on pancakes…. This entry was posted in canning/preserves, dessert, raw, vegetarian and tagged christmas, cultured, dairy free, fermented, gift, gluten free, healthy, medicine. Bookmark the permalink. I love ferments and I’m going to try this one. I have a salsa ferment I do when tomatoes are in season. Yummy! I tried this and love it! Would you mind if I post a link to your site? Hey, I made those the other day and its bubbling away in my cupboard. If I want the seeds to become boozy as I want to add to ginger bug later, how long should I ferment in the cupboard for? I have always moved mine to the fridge before they get to the boozy stage so I can’t give you an exact time. I would recommend that you taste every couple of days and just keep an eye on it until it gets to the booziness that you are looking for. Sorry I couldn’t be of more help ❤ I'd love if you could comment after you experiment and let me know how long it took! Do you think I could use pomegranate seeds that already seem a bit fermented? They smell like nail polish and I’m not sure what to do with them. Thanks for the advice, I think that’s a good idea. Also, please check out this website when you get a chance: http://www.mostholyfamilymonastery.com. It’s about the true Catholic Faith. My husband came across it some years back and we try to give it out as often as possible. It’s really great! Do you see a problem using a new food grade plastic jar instead of glass?